★Shipping Information★:Please allow 48hours business days for shipping. -All U.S orders are shipped from USA(standard shipping),FedEx SmartPost,USPS,UPS unless otherwise specified. -U.S Estimated Delivery Time: 4 – 8 days. -All international orders are shipped via EUB. -Internationally Estimated Delivery Time: 10 – 25 days. COMPATIBLE: ZVE iPhone 6/6s Wallet Case ONLY fits for Smaller Apple iPhone 6/6s, the 4.7 inches version ! 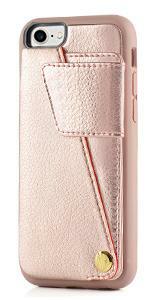 MULTIFUNCTIONS: 1) 2 Card Slots and 1 Money Pocket, carry around your essentials cards easily. 2) 180°Rotation Card Holder, the card holder can be HIDDEN in the back. 3) Secure Magnetic Closure，magnetic flap to keep it closed and protected. FULL-FRAME PROTECTION: Covers all corners and includes RAISED EDGES and a TPU lip to keep the screen from scratching or touching the ground. 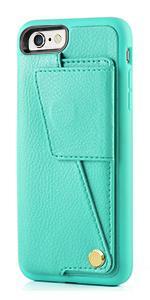 HIGH QUALITY MATERIALS: Made from PU Leather + TPU base shell. Our 100% HADNMADE craftmanship and reinforced stitching makes it even more durable and 100% shockproof. 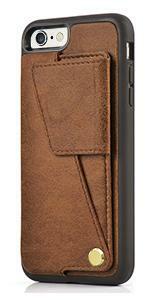 *Is this case bulky or does it fit easily in a jean pocket? -No, it’s not bulky, it will fit in a jean pocket pretty good. *What is the max number of cards it can hold? 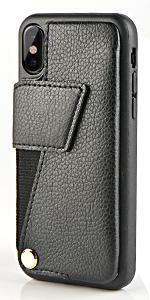 -It has 2 card slots and 1 back pocket for cards and cash, very convenient for your daily need. *How well does this case protect the phone? -It covers all corners and includes RAISED EDGES and a TPU lip to keep the screen from scratching or touching the ground. *Is this case made of safe materials? Can the distributor advise consumers of any harmful chemicals in this phone case? 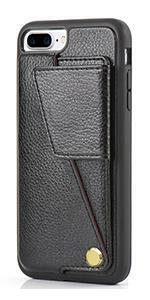 -Made of a plastic type material that houses the phone, the back is a leather type material. There are no harmful chemicals in this phone case. *Will there other colors besides mint, brown and black? -Yes, we also have rose gold now, for iPhone 7 plus, iPhone 7, iPhone 6/6s plus and iPhone 6/6s.